We learned from social media on 6 April that a group of employers has proposed the introduction of the apprenticeship, which could have significant implications for the profession and the public. The PDA understands that the group included two major community pharmacy employers but it is unclear which other employers were involved. The PDA urge you to respond to this consultation. Click the button below and search for Pharmacist apprenticeship to find the consultation. (This survey takes about 5-10 minutes to complete). The apprenticeship would be led and controlled by employers, leading to a two-tier approach to qualifying as a pharmacist. An apprenticeship route for qualification as a pharmacist would be highly disruptive to the pharmacy profession. It would shift the profession away from a professional University-led model to a model traditionally associated with technical occupations. Apprenticeships would be appropriate for pharmacy technicians, but our view is that they are not appropriate to achieve a qualification as a pharmacist. If the apprenticeship development goes ahead, whilst under existing EU law (Directive 2005/36/EC) it would need to be developed in conjunction with a University, any employer could use it, outside of the normal UCAS application process. Entry standards and more broadly the entire initial education and training of pharmacists would be influenced by large corporate employers. We would not wish to see a reduction in standards and deprofessionalisation if employers sought to reduce costs. The proposals would potentially lead to increases in the number of registered pharmacists, affecting the balance between supply and demand and diminishing the tried and tested routes of pharmacist education. Ultimately this would not be in the public interest, since it is important that the profession remains attractive enough as a University Masters-level qualification so that appropriate standards are maintained to protect patients. The profession has not been widely engaged or consulted as to whether it wants an apprenticeship to be introduced. On that basis alone it should not proceed. There are many unanswered questions which cannot be addressed satisfactorily within the short timeframe available. The minimum wage for apprentices is £3.90 per hour in the first year then defaults to minimum wage. This could undermine the value of the profession. 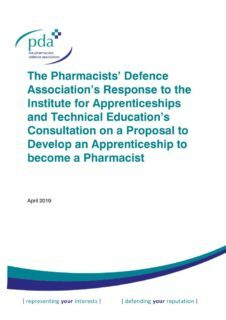 The PDA understands that the apprenticeship proposal has been in development for the past two years, although we are unaware of any information being disseminated to the wider pharmacy sector during this time. There seems to be no official information in the public domain about the employer trailblazer group that developed it. Though the GPhC and Royal Pharmaceutical Society have reportedly been consulted, there has been no mention of the apprenticeship in the public GPhC Council or RPS Assembly and England board meeting papers in the past two years. Our understanding is that the Pharmacy Schools Council, comprised of representatives from the pharmacy universities, was also unaware of the consultation. The PDA had not been approached despite being the largest pharmacists’ organisation in the UK. The consultation runs from 4 April to 14 April, allowing only 7 working days to respond. Pharmacists have consistently raised serious concerns about patient safety in surveys conducted by the PDA over the past three years, including in relation to staffing levels, workplace pressure and corporate targets within community pharmacy. The PDA’s view is that it would be inappropriate to consider an apprenticeship model for pharmacist qualification whilst these significant concerns remain. It would not be good basis on which to proceed for the future of our profession. The continuation of the consumer/supplier type route – as preferred by vertically-integrated wholesalers. This model prioritises product volume throughput and has a very limited long-term future. The development of the healthcare professional/patient relationship – this relies upon clinical services being delivered by pharmacists and turning the community pharmacy into a healthcare hub. If pharmacist training courses are designed or influenced by organisations wedded to the consumer/supply model they are likely to produce pharmacists predominantly prepared for that model which would be highly detrimental to the long-term strategic health of our profession. 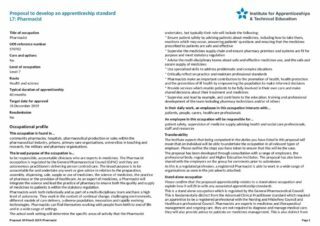 Even if as an individual you ultimately support the introduction of an apprenticeship, the one-page proposal is poorly worded and factually inaccurate. It wrongly states that pharmacists “are not required to diagnose and manage medical care” and steers the qualification towards an employer-led view of what pharmacists should do. It also focuses on medicines management instead of pharmaceutical care, which in our view takes the profession in the wrong direction. Our response to the consultation can be viewed by clicking the button below.